Apple plans to announce its earnings on April 30. The result for the first quarter could be below expectations, as the company announced at the beginning of January, after that the share price reached its low for the year to date. From then on, however, the share recovered. Since our last look at the stock on March 25 (link: Is Apple changing track? ), the market has been able to maintain its upward trend. 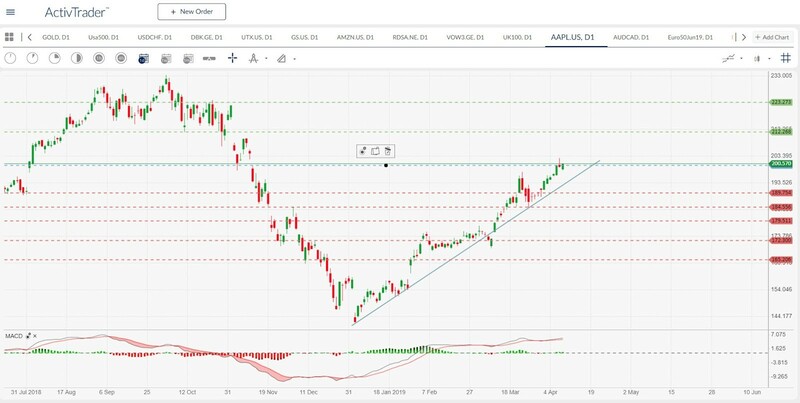 The Apple share is testing the upward trend line, but this was able to offer support for the market. Finally, on Tuesday of this week, the market reached its high for the year to date at over US$200. Now the question is whether the bulls will be able to maintain the run of almost US$60 since the January low? If the US$200 mark slows the bulls down and there is a short retracement, the upward trend line could again provide support. If the market falls through here, then there is potential further support at US$190. If the market breaks down here as well, the question is how sharp the correction will be? Possible additional support could then be in the US$185, US$180, US$172 and US$165 areas. The two lines of the MACD oscillator are in positive territory, but very close together. The histogram shows a low momentum. The many possible supports, therefore, result from the fact that it is not easy to value a stock like Apple before earnings. Because this could be the essential information, namely how many shares Apple bought within its buyback program and how the expectations regarding a dividend are to be classified. If the bulls stay on track, the already mentioned structural levels remain at US$212 and US$224, and these could offer resistance to the market.